Beyond Words: Effective Use of Translators . 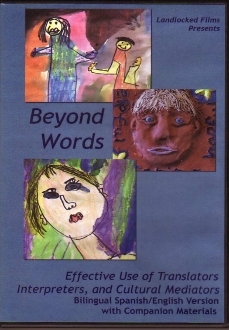 . .
Browse our videos >> Beyond Words: Effective Use of Translators . . . This video addresses the need to have well-trained interpreters, translators, and cultural mediators using a team approach. It examines recent trends in school demographics and offers specific training on how to resolve cultural misunderstandings between schools and and families, how to develop trust and empathy between families and professionals, how to employ the best strategies for translation and interpretation in school settings. Bilingual Spanish/English DVD includes downloadable companion booklet and handouts.